Fresh from its award-winning transfer from the Shakespeare’s Globe Theatre, this play about 16th century poet Emilia Bassano successfully employs – and subverts - many of the theatrical rules (e.g. ‘women only’) and creative devices used during the days of William Shakespeare - with whom she had a pivotal romantic, artistic and intellectual liaison and was, by common consent, his muse and artistic equal. The play sets out its stall from the beginning: an older ‘Emilia’ (Clare Perkins) walks purposefully through the auditorium, before arriving on stage to read out a contemporary reference to herself (“…she was a whore”). After contemptuously throwing away this missive, she introduces the other two ‘Emilia’s’ (Saffron Coomber and Adelle Leonce) onto the stage and then invites ‘us’, the audience, to make up our own minds. As she herself states, we must start ‘where all good stories begin – with a death’. So, after hearing of her court-musician father’s demise, we see the 7-year-old Emilia (Coomber) left, by her mother, in the care of the Countess of Kent. Her introduction to the ‘meat-market’ that was 16th century Elizabethan court is a choreographic and comedic delight; the baroque music and movement interwoven skillfully with contemporary drum-patterns and dance-moves, just as the subtext of childhood abandonment is leavened by the wit and physical humour on display from the ensemble. As Emilia passes through a life of pregnancy, marriage, grief and male-patronage – as well as the oft-mooted relationship with The Bard himself– we see that what fuels her (aside from her love of poetry) is a fierce need to be seen as an ‘equal’ to any man (including The Bard himself - gasp). As she ages, we see this develop into a desire to empower other women. To whit, she sets up a school and – in the process – publishes her work. At a time when the religious zealots and misogynists used their power - and the superstitions of the day - to control women (and the masses), fear of persecution, torture, drowning and burning was rife, especially for those women accused of witchcraft. 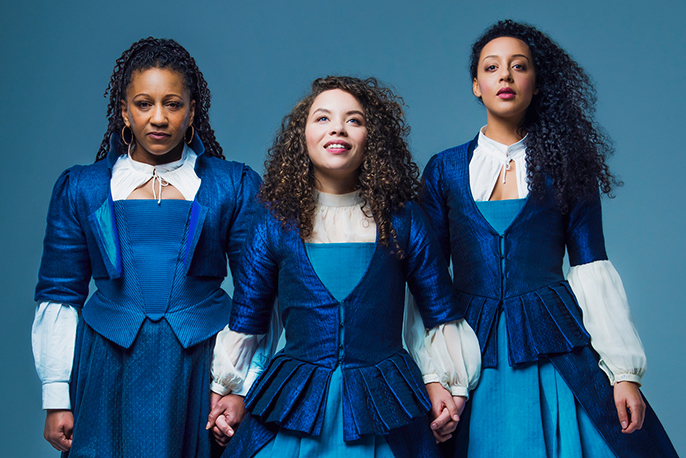 The gruesome cost of being found guilty of this ‘crime’ (laid bare at one stage) is foreshadowed during the second act, and focuses the audience’s attention to the ‘stakes’ for Emilia, and all divergent women (then and now). However, it’s the three Emilia’s that bring the piece home – each one superbly offering a different aspect to the character. As previously mentioned, the serious aspects of the play are balanced beautifully with humour. There is one particular 4th-wall breaking recreation of a live performance of an actual Shakespeare play that is an absolute delight: a grand opus of interweaving dialogue, argumentative shouting matches (from box to box) and Shakespeare’s own dialogue, culminating in (a fed up) Emilia’s epic stage invasion, before one of the horrified ensemble runs offstage, screaming the words “There’s a woman on stage” (!) Fabulous touch. What could have been just an interesting story about England’s first published female poet (women of the day were only allowed to publish religious texts at the pleasure of the male-dominated clergy) is transformed by the virtuosity displayed by the leads, the ensemble and the entire creative cast. Playwright Morgan Lloyd Malcolm has written an entertainingly ‘modern’ play - one not only relevant to females, but to any marginalised group. If some of the dialogue is occasionally ‘a little on the nose’ (“foreigners coming here, taking our jobs”), it is more than compensated for by the breadth and scope of wonderful material, and the writer’s inference that – in London, at least – the expectations, pre-occupations and means of control have changed very little over time. Director Nicole Charles brings a measure of calm and control to the proceedings. From the first moment to the last, I felt supported by the telling, allowing me to truly enjoy the multi-faceted nature of what was being told. Composer Luisa Gerstein’s wonderful melding of acoustic sounds (cellos, flutes, ukulele, charango) and female choral work with electronic noise and contemporary beats elegantly support the timelessness of both the narrative and the emotional imperatives. Musical Director Yshani Perinpanayam and her wonderful musicians (often on stage) were certainly up to the task. Movement Director Anna Morrisey’s sympathetic, effective choreography also deserves mention, as does Joanna Scotcher’s Set Design, Zoe Spurr’s Lighting, and Emma Laxton’s Sound; all expertly and seamlessly realised. It is difficult to pick out anyone in the ensemble cast. With many of the actors combining multiple roles (often recurring), the energy and vitality never drop. Having said that, Amanda Wilkin (‘Alphonso Lanier’) is a comedic joy, her broad humour eventually giving way to heart-rending pathos. Although the story is told in chronological order, the three actors are regularly on stage together, either in isolated contemplation during pivotal moments, or demonstrably expressing the physical and emotional burdens shared by them all. The baton-changing transitions are also superbly handled (“You did well”). Saffron Coomber is a torrent of talent and energy – her stature belying her huge emotional, vocal and physical range. In any other production her performance would be described as ‘a tour-de-force’. Put simply – I enjoyed this wonderful production immensely. Adelle Leonce brings (quite rightly) a more measured aspect to the character; her emotive face perfectly reflecting both the pain and the poetry that figured so strongly in her life. But it is the mighty Clare Perkins who ‘mothers’ this production. From the time she enters – introducing herself as narrator and main subject – to her final ‘house-demolishing’ monologue, her righteous rage (and range) owns it – and us. This play not only addresses the injustice done to the reputation of its subject Emilia Bassano, it serves as both an entertaining celebration and lament for any female – or those deemed to be socially divergent - held back, abused, disregarded and silenced due to the systematic cultural, political and/or religious patriarchy of the day.